If you were wondering whether the cup in the above picture is for the giveaway, you’re right (details are at the end of this post). 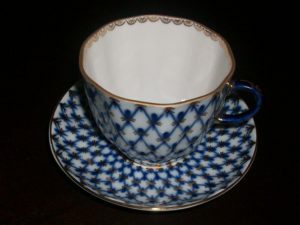 These Russian porcelain cup and saucer have famous cobalt net and genuine 22K gold and are hand decorated by an artist. My last name means green in Spanish. My maiden name means daughter of a fisherman in Russian (my dad does like fishing!). I enjoy finding out what first or last names mean. I even wrote a thesis about meaning of names in literary works by Gogol and Dostoyevsky when I was graduating from the university. I often like giving my characters names that reflect their ethnicity or nationality. The heroine of one of my books is Soledad Sokolova. Soledad means solitude in Spanish, and one of the reasons for it is that her mother felt lonely when she was expecting her. Russian last name is a hint on the heroine’s Russian heritage. The heroine of my recent release, Season of Joy, is Joy Avila, and the name describes her personality. Of course the main reason for the title is because it is part of the Christmas series. Now, I’d like to respectfully request your help in naming one of my secondary characters. Please meet the heroine’s daughter, Lana. The issue is that she’s named after her mother’s friend and having two characters with the same name can get confusing. So the child will be going by her middle name. But what is it going to be? Her mother is Kelly Hope, so those names are already taken. Lana Young is almost two years old. Kelly is raising her alone as Lana’s father died the very day Kelly was going to tell him she was expecting. The girl is rather quiet, doesn’t fuss much, giggles a lot, and is curious about everything around her. She has a favorite teddy bear she drags with her everywhere she goes. Many thanks in advance! Do you have a favorite name? What character’s name do you remember for many years? What is the meaning of your name? Do you like for the character’s name to reflect their ethnicity or nationality or personality? What about the ethnical names that are difficult to pronounce? Are you okay with them or would you prefer a simple name? 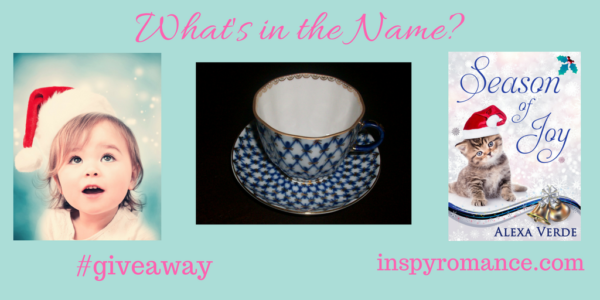 I’m giving away the porcelain cup (2.5″ tall) and saucer to one randomly chosen commenter to this post. The set is from Imperial Porcelain Factory. Aka Lomonosov Porcelain Factory, Imperial Porcelain Factory was founded in 1744. The giveaway will end on May 4th at 11:00 pm CST. The giveaway is limited to the U.S. commenters due to shipping costs. Although I don’t remember too much Spanish from my college years, I do remember Verde mean green. :) This is an interesting post, Alexa. I’ve never thought much about what my name means. I think I’ll Google it. That’s a beautiful cup. Thank you very much for the kind words about my post and the prize, Jill! Hi Alexa:) Names are very interesting, and I really do like for a character’s name to reflect character/personality/ethnicity etc. I have no problem with difficult names, provided there is a pronunciation guide at the beginning of the book (too many are at the back of the book which makes it harder to find with an e-reader!) Celtic names are the trickiest to pronounce, Niamh being a classic example! My name is English in origin and appears to originate with J.M Barrie’s classic Peter Pan, who named his female character after a young friends’ description of him as “fwendy” (friendly). Both my sons are named after special characters- one from the Old Testament, the other from C.S Lewis’ classic The Horse and His Boy. Thank you, Wemble! I love the origin of your name and of your sons! It’s interesting. I like Eliana, and I have to say that’s one name that never occurred to me. This is a great advice, to provide the guide to the difficult name’s pronunciation at the beginning of the book instead of the end. I imagine reading a book and pronnouncing the name of the character in my mind one way, only to find out in the end that the pronunciation is totally different! I like names that reflect nationality or heritage because they sound more real. Sometimes I struggle to pronounce them but as long as I get the gist, it’s fine. Now what really bugs me is when the author adds similar names that are equally hard to pronounce and I can’t keep track of who’s who. When the mames are spelled differently enough, that’s fine. I’ve never looked into my name. Mine is just the female version of Andrew, lol. As far as a middle name for Lana, how about Sophia (wisdom, wise). Sophia is awesome! As for your name, I think Andrea is a very beautiful name. Before I was born, it was decided that if a baby would be a boy, the name would be Andrew! Wonderful meanings of your first and middle names, Sherri! And thank you for kind words about the prize! Thank you so much for the lovely words about the post and the giveaway, Britney! Very kind of you! Yes, the name Faith is great, and fits so well for Christian romance! When I learned (in the 6th grade) that my name meant Pearl, I was delighted! If I had a daughter, I was going to name her Crystal (after my maternal grandmother) Joy. So I’d suggest Joy as Lana’s middle name. Thank you, Margaret! The meaning of your name is so beautiful. In high school, I wrote a long poem “Margarita” (Russian version of the name “Margaret”), which is more a rhymed romance than a poem, really. One of my favorite names ever! I love the name Joy, but the heroine has a sister-in-law named Joy. But I don’t have a character named Crystal, and it’s such a beautiful name. I love the meanings of names! Valerie means strong, and I was shocked to find it’s a fairly common male name in Russia! 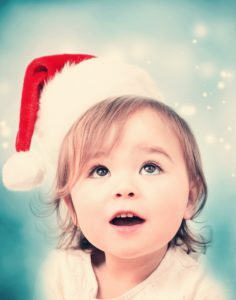 Can you make the child’s middle name Lana instead of her first name? Or you could go with Lana Elizabeth, which gives you a wide choice of nicknames if you chose to shorten it. Or maybe Lana Margaret. I think Margaret as a name is making a comeback. Thank you, Valerie! Yes, Valeriy is a very common name in Russia. There is a female version of it, too, Valeriya, but it’s less common. Elizabeth is a lovely name. And I love Margaret, or maybe “Marga” as a nickname for a child. If i had had any girls I wanted to name one Dacia Rose of Dacia Cheri. We have 2 sons & 3 grandsons. Rose would have been for my grandmother. She immigrated (through Ellis Island) in 1898. I don’t know what Dacia means but it is an old Latin name. Would love to win the tea cup. Reminds me of having “tea time” with my grandmother as a little girl. I still love my hot tea. Thank you, Patricia G Moore! Best wishes in the giveaway! Dacia Rose and Dacia Cheri are beautiful names! And I love the tradition of drinking hot tea with honey or jam and enjoying a slice of pie. I miss that sometimes! Gail means “source of joy” my married name Hollingsworth has something to do with “holly”.For that reason we planted a holly bush in our yard. I think it’s interesting that a lot of last names came from occupations of the people. Lana Marie Young would be beautiful. No personal connection for me just one that popped into my head. I love the cup and saucer! Today is my birthday and it would make a great gift wink 😉 wink! Happy Birthday, Gail!!! Wishing the world of happiness! “Source of Joy” is such a lovely meaning. And totally true, lots of last names come from the occupations of the people. I agree, Lana Marie Young sounds beautiful. Awww, thank you very much for your kind words about the giveaway! One of the character names that I still remember from my childhood reading is Polly Pepper. She was the central character in Five Little Peppers and How They Grew. I read that book multiple times growing up. My name means Bee. For a long time I thought that was just a weird meaning. A few years ago I heard a speaker at a Woman of Faith conference that talked about the bee and and how amazing it is that it can fly. That made me recognize that the bee is a miracle of God. So am I! I thoroughly enjoy meeting new characters in books and I love trying to figure out why the author gave them the name that they did. Thank you, Debora! What an interesting meaning of your name. Polly Pepper is definitely a fascinating name. I loved what you just said, that the bee is a miracle of God! And so are you! Thank you so much for sharing! Amada means loved,this would be a good name for the toddler. I don’t have a favorite name and remember any favorite character names. My name Linda means beautiful in Spanish. It is special that a child has a name that represents their ethnicity. Thank you, Linda! I agree, Amada is a good name for a toddler. I love the meaning of your name, and if I may say, I think it suits you wonderfully. My maiden name is Scarlett which reminds me of the Scarlett Letter and Scarlett O’Hara. It is also a color. I recently discovered my ancestors were from Great Britain. As for a name how about Rose or Rosie? I find it distracting to read a book where I can’t pronounce a name. Each time I read the name I waste time saying it different ways so a guide would be great. Hi, Sue! I think Rosie would be a great name for a toddler. :) Writing a guide how to pronounce the name is a great idea. I’ll definitely need to remember this. Thank you very much for the ideas! And how cool to discover where your ansestors are from! What about Lana Rose. I have no idea what my name means, now I’m wondering about it. Lana Rose seems popular! And a lively name. Thank you very much, Dianne! Lana Joy because even though she lost her husband, she believes her child is the outcome of joy from her marriage and life going forward. Hi, Joy! I absolutely love your name! Such a delightful name and always makes me smile. I love Joy’s suggestion. So hopeful and positive! But all the name suggestions are beautiful! My name- Autumn is actually my nickname. My real first names are Lillian Jane. Lillian after the grandmother who died just before I was born, and Jane because my father liked the name. I knew Jane meant “God’s blessing”, but never looked up Lillian before, because I thought it was from the lily flower. Turns out it’s actually a form of the Biblical name Elizabeth, meaning God is abundant! I like the name better now! Wow, Autumn! Such meaningful, beautiful names! What about Lana Grace? It could be a reminder to her of God’s grace and I like the way the names sound together. I don’t mind ethnic names as long as I can pronounce them pretty easily. Lauraine Snelling’s Red River books have a lot of Norwegian names and some are easy to guess at the pronounciation and some not so much. Although, I do love the name Astrid which I discovered from those series. Hi, Jessica! God’s grace… The meaning of Grace is profound on so many levels, and I love what you said. Lana Grace is beautiful! As for Astrid, it’s one of the names I remember from childhood – I loved reading books by Astrid Lindgren. They were among my favorite books. Thank you for sharing!